COLUMNA MESSIANIC RESEARCH CENTER: WHAT IS YOUR BIGGEST MISTAKE IN LIFE? WHAT IS YOUR VIEW OF MISTAKES? CAN YOU CELEBRATE YOUR MISTAKES? Can you easily give your answer? WHAT IS YOUR BIGGEST MISTAKE IN LIFE? WHAT IS YOUR VIEW OF MISTAKES? CAN YOU CELEBRATE YOUR MISTAKES? Can you easily give your answer? One of the greatest obstacles before we reach our goals in life is our fear of committing mistakes. Nevertheless, we must realize that success is achieved after we make mistakes, several mistakes. In the 2010 Miss Universe beauty contest, the Philippine candidate, Miss Venus Raj, was asked the question: WHAT IS THE BIGGEST MISTAKE IN YOUR LIFE... and what have you done to correct it? This seems to be a hard question to answer by most people. Miss Philippines did not directly answer the question because it is her belief that MISTAKES in life are not really mistakes, but are challenges in life. The phrase, "MAJOR MAJOR" then became a popular quotation and it spreads as wildfire throughout the world via the Internet and the mass media. MISS PHILIPPINES HAS THE SAME VIEWPOINT AS THE GREAT INVENTOR THOMAS EDISON! Thomas Edison was once approached by his two discouraged assistants who told him, "We have just completed our 700th experiment and we still do not have an answer. We have failed. "No, my friends," said Edison. "You have not failed. It's just that we know more about this subject than anyone else alive. And we are closer to finding the answer because now we know 700 things not to do." Edison further said, "Do not call it a mistake; call it education." What a wonderful perspective! We do not know how many attempts (or mistakes) Edison took before he finally achieved success. Some said 10,000 mistakes, but we all know that eventually, he and his colleagues did see the light. Literally! Sometimes mistakes are not really mistakes. They are just part of the growth process. Whether you are an inventor, a beauty queen, a student, an ordinary employee, a minister, or a business executive, you must adopt the same principle and perception that guided Edison in his laboratory work: Learn from your mistakes and keep going! WHAT DO YOU MEAN, MISTAKE? First, let's define what is a mistake. What is a mistake? A decision, action, event is considered a mistake when it does not contribute, conform, lead to a certain belief, goal, purpose, or mission. Mistake is also called an error, fault, or failure. There are at least 3 different kinds or degrees of mistakes: low-risk mistake, high-risk mistake, and mistake-that-you-can-make-only-once. I am talking here of the mistakes that we normally commit in our everyday lives in our jobs, in our career, and in our Christian overcoming. Mistakes also depend on the time and location of the decision or action. For example, it is not a mistake to sleep at home, especially during night time. But sleeping become a mistake if done during worship services, or at any meeting, lecture, or conference. HOW DID WE ACQUIRE THE NEGATIVE FEAR OF MISTAKES? The CONFUSED KNOWLEDGE AND NEGATIVE PERCEPTION ABOUT MISTAKES LEADS TO MORE MISTAKES! This negative outlook was developed during the years of emotional and psychological problems we were exposed to. Schools set us up from the beginning to hate failure. Success in the form of good grades was our ticket to graduation and a good college. Our parents certainly never praised our flops. And most probably, every boss we ever had lacked the understanding and vision to see the progress in failures. So the world we grew up honed us to believe that success is to be desired and failure to be despised. We were deceived in this belief. We then try to avoid mistakes, hide them, and sometimes we even tell a lie to cover those mistakes. Our perspective to mistakes then became negative. Now, almost all people shy away from mistakes. Fear of failure or mistakes now paralyses people. And because people are easily and irritated and angered with mistakes, they have that natural reaction to punish or to look down on people making mistakes. "EVERYONE MAKES MISTAKES." YET, ALMOST EVERYONE CONDEMN AND IS EASILY ANGERED BY MISTAKES! Yet, everyone believe that "everybody makes mistakes." But when someone makes a mistake, even an honest or innocent mistake, people, especially those in the higher authorities, will immediately condemn and look down on the doer of mistake. This is just the natural way, or how the "human nature" reacts. Thus, almost everybody covers and lies about their mistakes, making those mistakes remain unsolved, and therefore, are bound to happen again! All of us make mistakes, whether knowingly or unknowingly. Depending on our personal perception of mistakes, they can become barriers to our enjoyment and success in life, or it can also become stepping stones to our success and joy. WE HAVE TO CHANGE OUR OUTLOOK AND PERCEPTION OF HUMAN MISTAKES! We must a healthy allowance for mistakes, necessary mistakes. The freedom of choice that God gave man means that man is surely bound to make mistakes. This means that we should look into and learn from our every thought, intentions, decisions, words, and actions. This includes looking into the details of both our life successes and failures. If we celebrate our success, then we should do the same to our mistakes. What? What did you say, Mr. Columna? Yes, we have to look at our mistakes in a positive outlook, and to emphasize this new outlook, we say, CELEBRATE YOUR MISTAKES! This article will give you a fresh perspective on how to deal with our human mistakes, that may even include the trials that we encounter in our Christian life. And most importantly why we should scrutinize those mistakes and allow those mistakes to encourage us instead of discouraging us. Before we confront mistakes, we must first know what kind of possible mistakes we are capable of doing. To better face mistakes in life, we must categorize mistakes according to their level of risks. Only the first two levels of mistakes should we confront. The third one should never be attempted. 1. LOW-RISK (CREATIVE) MISTAKES. These are the mistakes you can afford to make as often as you want, and it doesn't endanger anyone. Examples: pressing the wrong keys of a computer or a piano. This will teach you the right keys from the wrong keys, or even stir your creativity. These mistakes are not really mistakes. They are just part of the growth and educational process. 2. MEDIUM-RISK MISTAKES. These involves a certain degree of risk. These also needs a certain degree of courage on your part. Example: starting your own business. If you make mistakes in your decision or investment, you can lose your financial stability. But if you don't make a mistake, the reward is great. 3. HIGH-RISK MISTAKES. These are the mistakes that involve life and death situations, or that will wreck havoc and destruction that cannot be reversed. These are the mistakes that you cannot afford to happen even just once, and should be prevented as much as possible. You should never attempt to experience this kind of mistake. If you think there is a chance for this mistake to happen, then stop the process immediately. Example: if you are sleepy or drunk, you should never attempt to drive a car. WHY WE SHOULD CELEBRATE MISTAKES! So if a mistake is an error, a failure, is it not that we should avoid them in our lives. Then why in the world should we celebrate mistakes? You might ask. We should celebrate mistakes for its positive challenge in our goals in life. We should celebrate mistakes until we eliminate those mistakes. In celebrating mistakes, we can have the opportunity to catch a potential problem early on, before it jeopardize our life, or our business. It is now time to overcome this negative fear of failure. We should now learn to celebrate our mistakes. Is there a biblical verse that support this principle? Yes, go to James 1:2. JOY = CHARA (5479). Cheerfulness, i.e. calm delight. 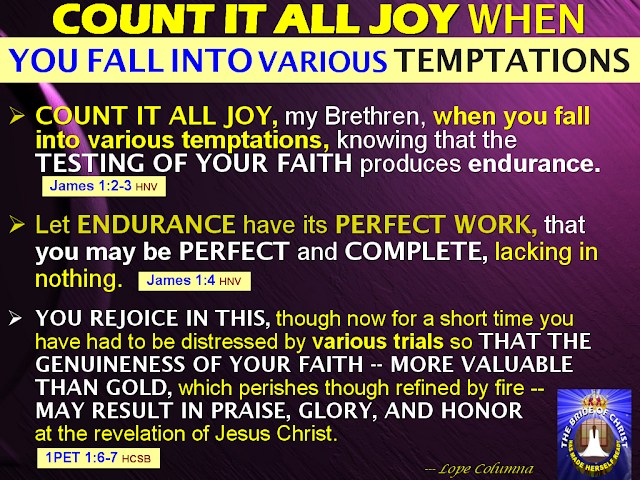 Gladness, to be exceedingly joyful, to rejoice. TEMPTATIONS = PEIRASMOS (3986). A putting to proof (by experiment [of good], experience [of evil], solicitation, discipline or provocation); by impl. Adversity. These trials are either caused by our own mistakes or the mistakes of others. Why should we count it all joy when we fall into failures and mistakes – or trials? Many Christians are hard up understanding how to enjoy or celebrate their failures and mistakes. We should have joy in spite of the pain because during trials or failures, we are given the opportunity to see within ourselves where to improve upon in our righteous character growth and developments. Mistakes learned are opportunities discovered. PERFECT = TELEIOS (5046). Complete (in various applications of labor, growth, mental and moral character, etc. Every time we make mistakes, even in our Christian overcoming, it only means that we are lacking in something. It gives us the knowledge that we are to improve on this area or that. Until we become whole and complete – perfect. We should rejoice or celebrate that we are little by little nearing to our ultimate goal – to be like Christ and enter God's family kingdom! Nice brief and this mail helped me alot in my college assignement. Thanks you seeking your information. thаnk you for аlloωing me tο comment!